International Community School is a learning environment unlike any other. Our model combines the most current educational research and practices into one unique school built on the three pillars of faith, family and scholarship. International Community School will train students to become learners and leaders through the strengths of a Christian faith, family engagement, and a challenging learning environment. Welcome to a place where students engage information with mind and heart, discovering its power to change them, to change perspectives, and to change the world. Welcome to a place that centers challenging academics and enrichment around a core of spiritual growth, while transforming a community by transforming each unique life. Welcome to a place where you as a parent are engaged in the foundation of your child’s education by design, with unequaled access to the resources, guidance, and encouragement you need for learning success. International Community School has a distinctive worldview. International Community School has a distinctive structure. Believing parents to be the primary source of spiritual and moral training for their children, International Community School is designed from the ground up to engage families in the educational process and to support and encourage them as they train up their child in the way he should go. Leading edge innovation that offers true choice in education allows parents to choose from different tracks. We offer university-style classes that combine instruction both on and off campus. International Community School has a distinctive academic and global perspective. International Community School is redefining global education to prepare exemplary students who are responsible citizens of the world. 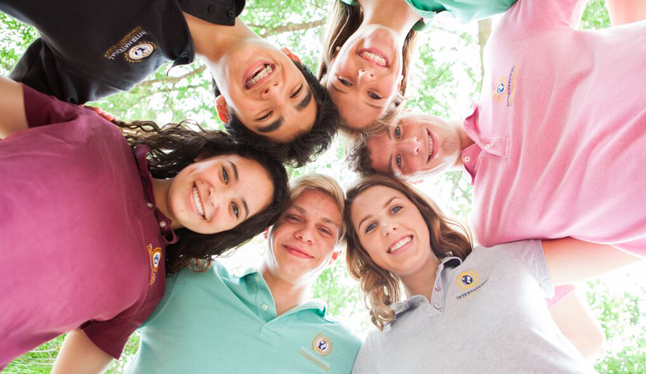 Through challenging academics, diverse enrichment opportunities and hands-on learning through work, service, and experience, ICS is developing students who are prepared to respond to the ever-increasing globalization of cultural, social, economic, business and political systems with a Christian worldview. Our unique academic structure combines the best in practice and curriculum to train minds in each stage of development—from learning facts and figures to developing critical thinking and the defense of ideas. Recognizing that each student has different pathways to learning, ICS encourages diversity in classroom methods and celebrates the uniqueness of each individual that joins with us to create our community. At this time, International Community School is not certified by the Student and Exchange Visitor Program (SEVP) to issue the Form I-20 to international students seeking an education using a F-1 visa. ICS will educate and equip students to bring Christ to the world by engaging culture biblically with their hearts, minds, and hands. ICS exists to prepare students to become learners and leaders through the strengths of a common Christian faith, family engagement, and a challenging learning environment. The Scriptures – We believe that God inspired all the words of the Bible without error in the original writings. The Bible constitutes the only infallible and sufficient rule of faith and practice. We accept the Bible, including the 39 books of the Old Testament and the 27 books of the New Testament, as the written Word of God. The Bible is an essential and infallible record of God’s self-disclosure to mankind. God – We believe that there is but one living and true God, perfect in all His attributes, one in essence, eternally existing in three persons – Father, Son and Holy Spirit. Jesus Christ – We believe in the full deity of Christ, His virgin birth, His real humanity, His sinless life, His substitutionary death, His bodily resurrection, His ascension into heaven, His present ministry as high priest and His future personal return to this earth. The Holy Spirit – We believe in the full deity of the Holy Spirit, who convicts sinners and regenerates those who believe in Christ. He also indwells, sanctifies, instructs, and empowers believers for service, and seals them unto the day of redemption. We believe that every believer is indwelt and baptized by the Spirit at the time of salvation. We believe being filled with the Spirit or walking in the Spirit is living in the conscious presence of the Lord Jesus Christ, letting His mind, through the Word, dominate everything that is thought and done. Man – We believe that God created all things as described in Genesis. We believe that the first man, Adam, sinned, bringing spiritual death to all mankind, who therefore stand condemned, making the new birth absolutely necessary. Salvation – We believe that salvation is wholly of God by grace on the basis of the redemption of Jesus Christ, the merit of His shed blood, and not on the basis of human merit or works. God gives eternal life to those who repent of their sins, and put their faith in Christ alone, justifying them instantaneously by the blood of Christ and imputing His righteousness to them. The Church – We believe in the universal church to which all believers belong. We believe in the importance of the local church, which is made up of believers who gather for worship, fellowship, and teaching. We believe in the responsibility of the church to fulfill the Great Commission of Christ, preaching the gospel to all nations. The Future – We believe in the eternal existence of the soul, resurrection of the body, eternal blessedness of believers, and eternal punishment of unbelievers. Christian Living – We believe we are called to be salt and light. We believe as Christians we are called to reclaim His world and to be agents of renewal and restoration. Parents are given the responsibility of raising and training their children in the Christian faith. We believe that the Family unit is designed by God and that the Creator’s intent for human sexuality finds its fulfillment between a man and a woman within the bond of a marriage covenant. We ask that members of our administration, faculty, and staff teach and proclaim only those doctrines in agreement with our Statement of Faith. We desire to glorify God by being zealous about the things that truly build up the body of Christ and clearly communicate the gospel of Christ, speaking the truth in love.